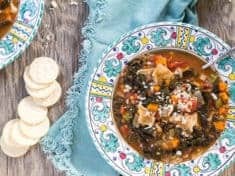 This nourishing soup is easy to put together recipe, and super fast, especially when you use a pressure cooker! 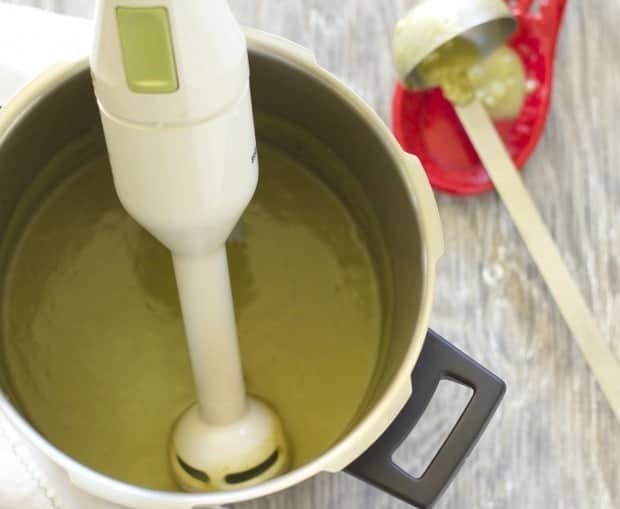 Use an immersion blender to puree the veggies and broth right in the cook pot. When it’s nice and smooth, add the cooked brown rice, and cook until it’s heated through. The pleasantly chewy rice grains enhance every spoonful with hearty texture and flavor. One of the reasons I love to make soup is that soup recipes are flexible. I am always coming up with new soups depending on what’s in the fridge and freezer. That’s how this soup happened. We found zucchini, chiles and herbs in this week’s farm share box. Then there was the tub of cooked brown rice in the freezer. 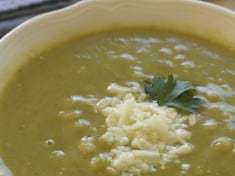 Yup–easy spicy zucchini rice soup! If you don’t have a stash of leftover rice, cook the rice beforehand. Why not make some ahead and have it in the freezer? Then when zucchini tell you it wants to be soup, you’ll be in the conversation, rice ready. 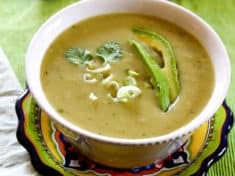 Light green aji crystal chiles from our CSA box bring sweet citrus flavor and spice to this soup. If unavailable—substitute a serrano chile. Both are fairly hot chiles. 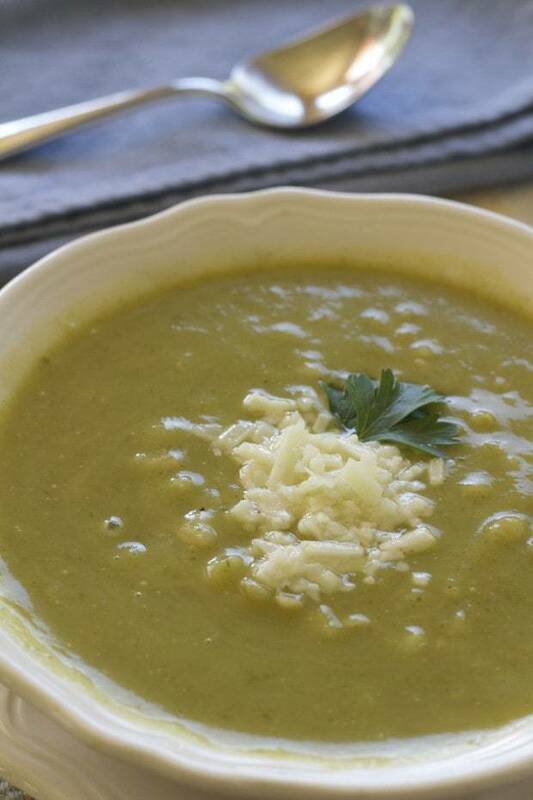 With an Instant Pot or pressure cooker, spicy zucchini rice soup can be on the table in ½ hour! In my kitchen, an immersion blender is as indispensable for soups as a pressure cooker. It’s a no muss–no fuss blender for hot liquids. Vegans omit the cheese. Optional: Serve with pumpkin seeds and/or slices of avocado. 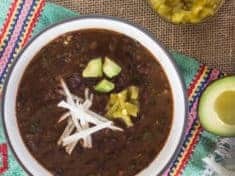 You’ll love this healthful hot soup in the fall, when there’s a chill in the air, yet the zucchini harvest is still going strong. Serve with a salad for a light and simple supper. Makes 4 to 6 servings. Heat the oil on medium flame, With the Instant Pot, set the sauté function. (see note) Sauté the onion and garlic several minutes. 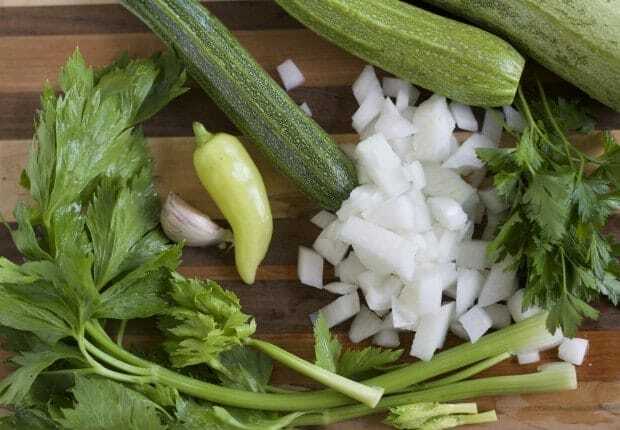 Add the zucchini, chile, celery, if using, and the parsley or basil. Pour in the vegetable broth—it will barely, or not even, cover the vegetables in the cookpot. 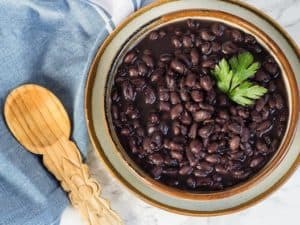 With the Instant Pot, manually set the time to 6 minutes. Quick release the pressure using the top vent. For conventional pressure cooker—bring to pressure and cook for 6 minutes. Quick-release the pressure under cold running water. Puree with an immersion blender. (see note) Season to taste with salt, if needed. Add the cooked rice, and heat until the rice is hot. Serve with cheese, if desired. Or garnish with pumpkin seeds and/or slices of avocado. 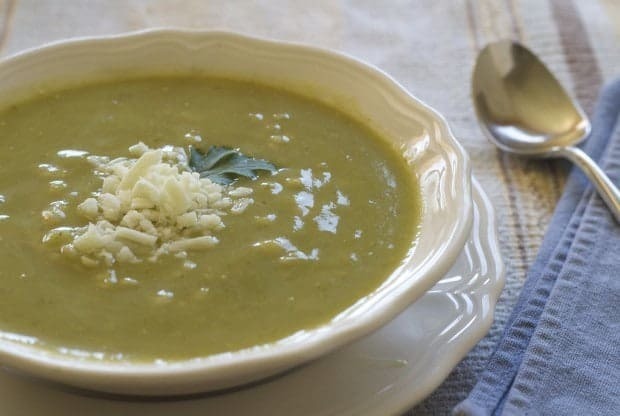 Spicy zucchini soup freezes well too! Thaw and reheat when you really don't have time to make dinner! Light green aji crystal chiles, originally from Chile, are about 3 inches long and add a sweet citrus flavor dimension to the soup. If unavailable—substitute a serrano chile. Both are fairly hot chiles. Use caution with the chiles. 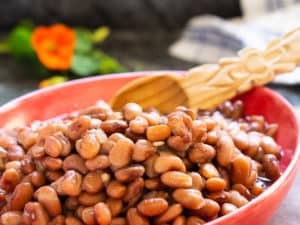 It is safest to remove the seeds--you want flavorful spice that doesn’t overwhelm the soup. If you don’t have a pressure cooker, cook the vegetables and broth until everything in the pot is very soft, about 20 minutes. If you don’t have an immersion blender, puree the soup in a regular blender. Blend the hot soup in batches—no more than half full. Use caution and keep the lid on tight.